Founded by Amahlia Stevens, Vitamin A is a beach and resortwear label launched in the millennium. It is renowned for its feminine and directional aesthetics, displaying a particular appreciation for fabric choice. Collections such as Vitamin A pants direct this leading formula into a range of staples for coastal and city scenes. Expect flattering and loose fits, lace or mesh inserts and a careful eye for detail throughout, enhancing the creative mood of the entire collection. 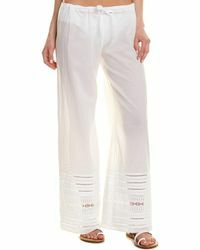 Ideal for partnering with your favorite bikini, Vitamin A pants deliver style from sand to streets.